“Journalism is not just about ‘reporting facts’. It is about ‘what’ to report and ‘how’ to report” says Vanessa Bassil, Director of the Media Association for Peace (MAP). 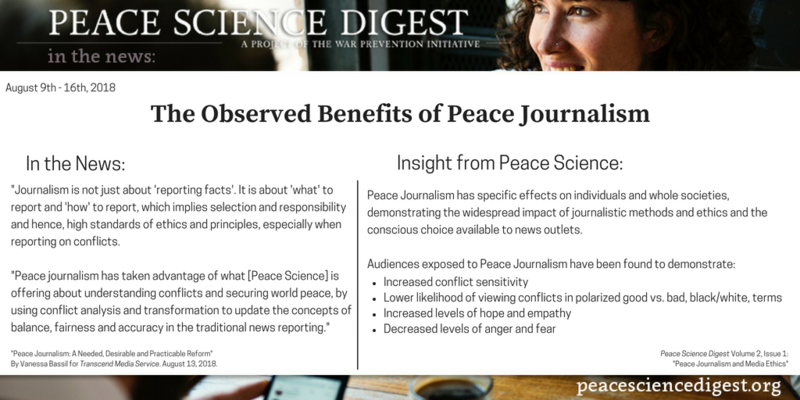 Peace Science shows that peace journalism has specific effects on individuals and whole societies–demonstrating the widespread impact of journalistic methods and ethics and the conscious choice available to news outlets. “Peace Journalism: A Needed, Desirable and Practicable Reform” By Vanessa Bassil for Transcend Media Service. August 13, 2018.